Well, for the first time in 3 months I made my way into the Forging shop to see what my body would let me do. OH MAN! I gotta get busy and exercise! I turned into a noodle! This is a project I'd started back before my guts went south, so I figured it would be an easy physical project. I started with a 1 1/4" X 5/8" thick piece of my "Fossil" Damascus, annealed. 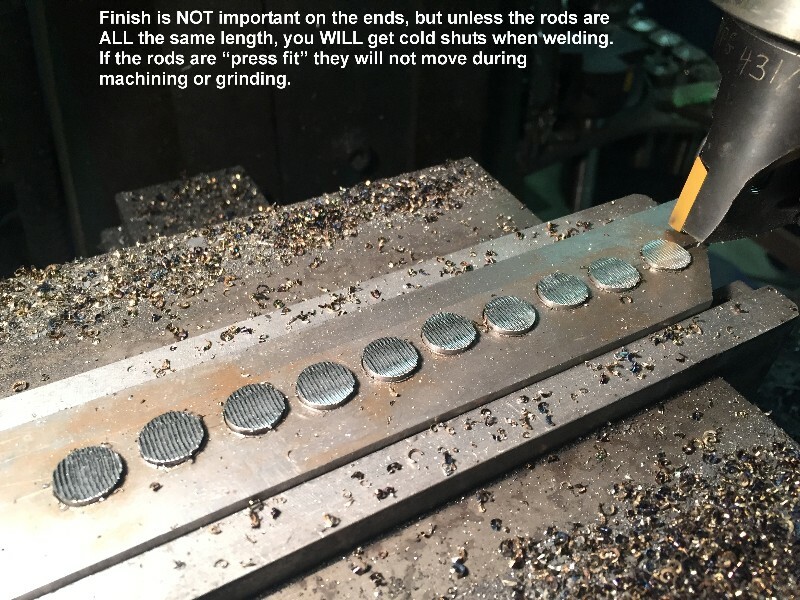 I bored 7/16" holes (no particular pattern). I'd already made some Explosion pattern damascus, and thought it would look good in a plug welded format. 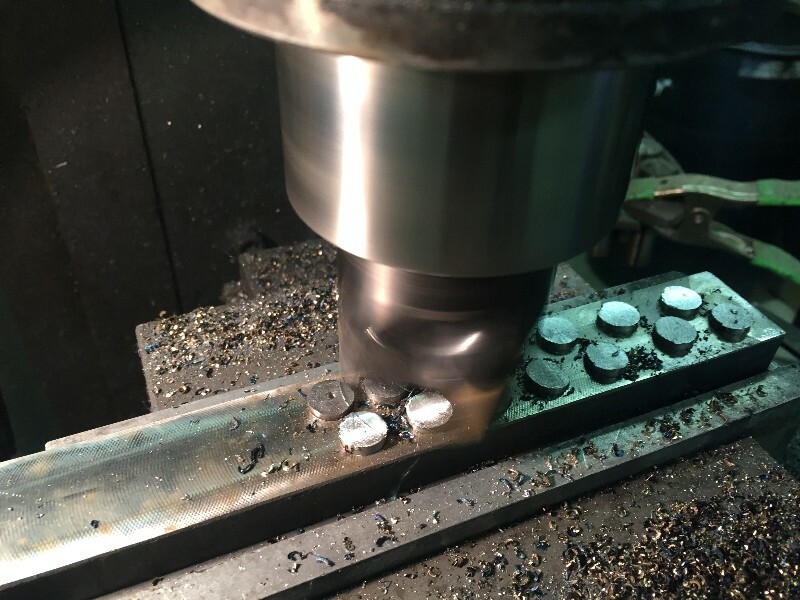 I forged the Explosion pattern billet round, then turned it down on the lathe to .4380" so I would have to "press fit" (drive it) into the 7/16" holes. I did the same thing with a piece of 1 1/4" X 5/16" 1084. I hammered the rod into place, then cut it off on the bandsaw. Filling all the holes. Next, I milled all the rods to equal length, milling both ends. 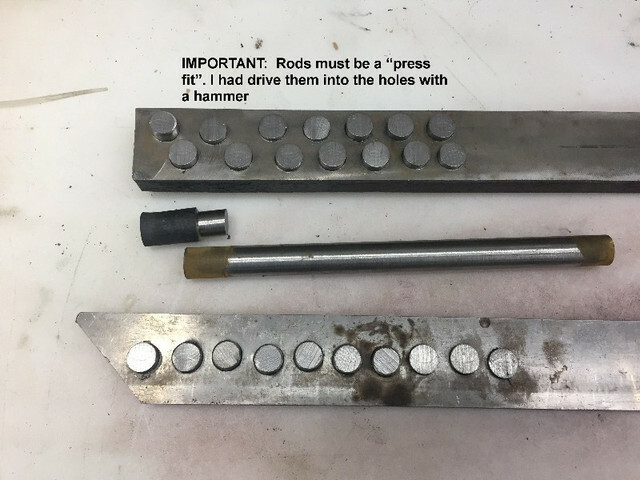 Finish on the ends isn't important, but having ALL the rods the exact same length is.... if they are different lengths, and you try to hammer or press them when welding, you WILL get cold shuts around the outer perimeter of the rods. 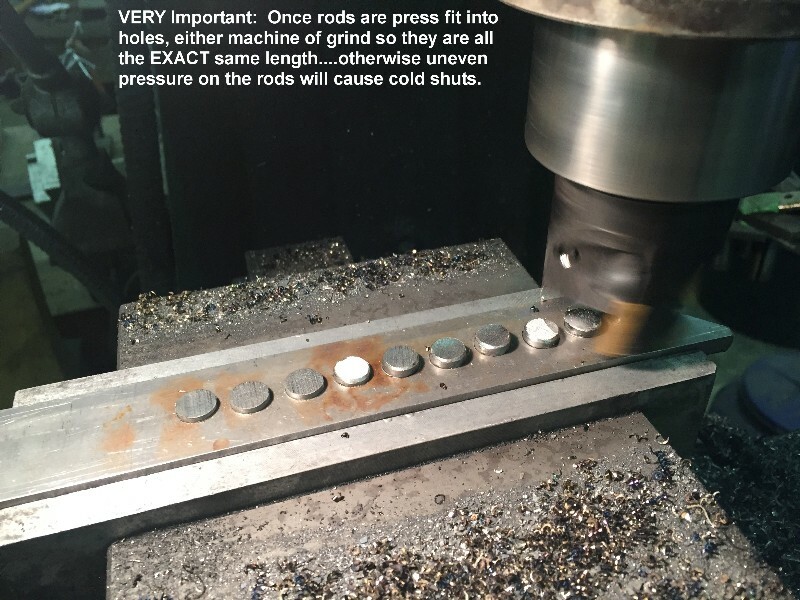 Once all the rods are to equal length, it's time to head to the forge! I've had issues in the past trying to do plug welds "dry", so I flux with anhydrous borax, and have much better success. 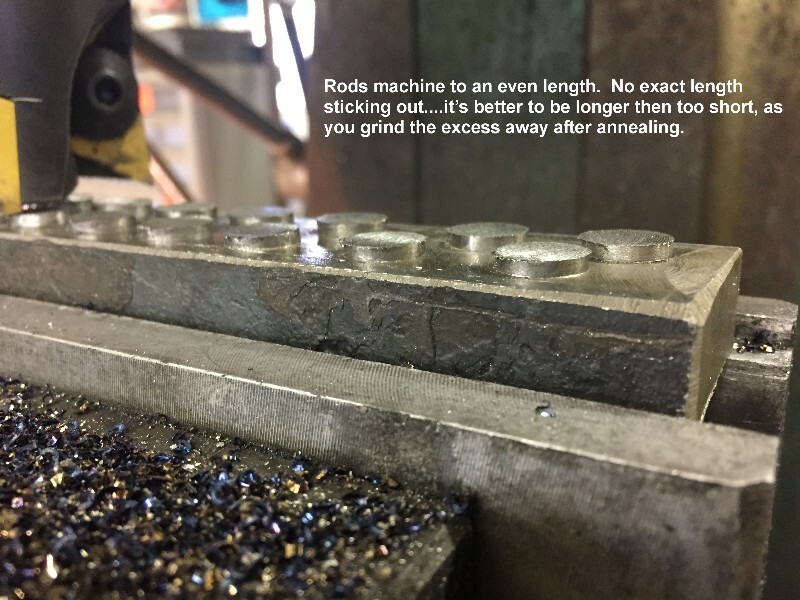 The key to welding, beyond proper temp/atmosphere, is to have the rods long enough that there is some remaining after welding..... if you hammer or press them flush with the surface, bad things tend to happen. My motto is..... I can always grind it off, but can never put it back! 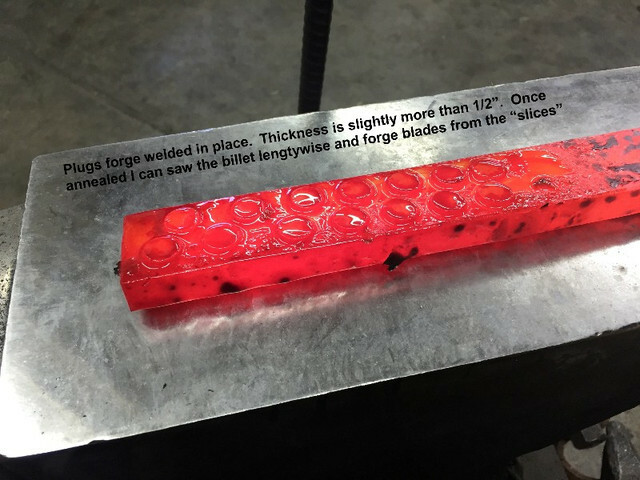 In the case of the above image, the billet is 5/16", which means that once annealed, I can bandsaw it into two, 1/4" thick "slices", and forge blade from those. Great post (and glad you could get to the shop). Looking forward to seeing the progress and then the finished blades. OK you got my attention, I am wanting to see what this process yields!! I have this feeling it is gonna be something good! Hey and take it easy on yourself, let your body tell you how hard to push it. Remember they just probed, poked and operated on the parts they didn't like the looks of!! Glad to hear you're able to work, Ed. Fascinating posts! I'm looking for ward to what comes next. That looks like an AMAZING process! Can't wait to see the finished results! I remember doing some back in the 90's. I was inspired by a smith who did a heart, Diamond, spade, clover down the side of a blade. His name eludes me now. Ed, I am waiting to see this one in the next phase!! I've got two blades from the steel profiled, and partially ground, but the healing body is only letting me do so much at a time before it's flat worn out. I ground for about 1/2 hour yesterday, and my abs were hurting so badly I had to call it a day. The Doc said it would be this way.....taking a while to build those muscles back up after he cut through them. Hang in there Ed - we're all looking forward to seeing this plug pattern - got to be amazing. 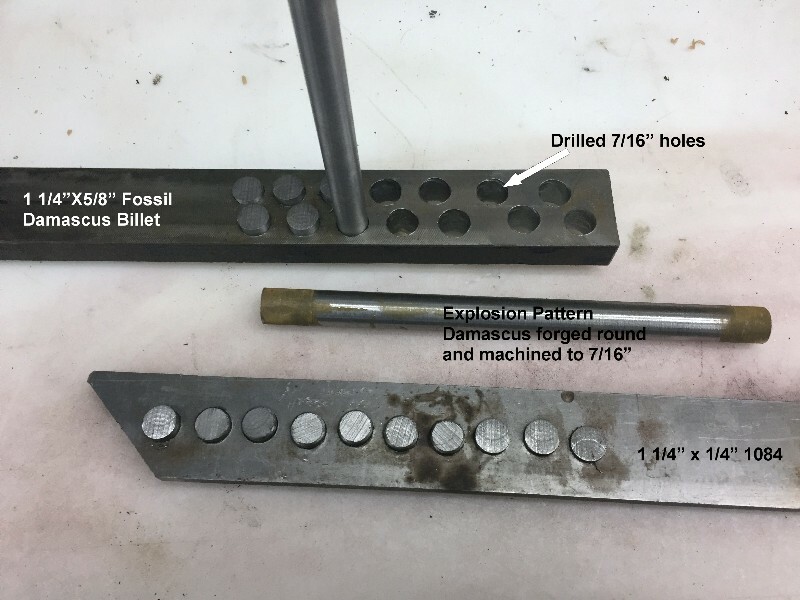 Not a great pic, but here's one of the Fossil billets that I "plug welded" with explosion pattern..... at 120 grit. Some days you eat the bear..... and some days he eats you! Yesterday the bear was hungry, and I lost one of the plug welded blades. Well, maybe not completely, I think I can make a smaller blade from it, but it's certainly not gona be the larger blade I was aiming for. 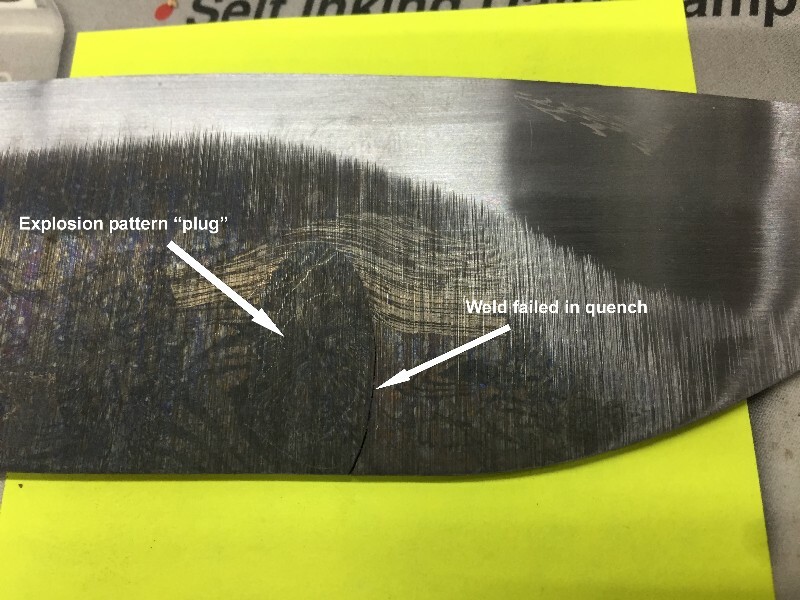 After studying it, and thinking about the materials and process, my inclination is that the plug weld failed because I got over zealous with drawing the edge bevels...... and this caused some over stressing when I quenched. It happens! s**t happens. Keep on keepin on, Ed. When you're handed lemons.....just make lemonade! As I often tell students..... It's not a mistake.... it's an opportunity to excel! I have to severely change the profile, but now I've got something that any "Mall Ninja" would adore! Wowzie!! That's so beautiful it looks like something Ed Caffrey would have made.